Dragons, firecrackers, red lanterns, awe-inspiring ancient structures, impressive modern architecture, advanced technology, bamboo scaffolding, tradition, friendly locals, orphanages, multitudes of silent electric scooters, loud market place haggling, cups of tea, fiery chilli and bottomless bowls of rice. Eclectic images greeted my family as we journeyed in China for a month. In preparation for our trip, we ensured our vaccinations were up to date, restocked our medication kit, and in an attempt to grasp some basic language skills, I enrolled in a short Mandarin language course. Beijing is a massive city, home to over 22 million people. We relied mostly on local taxis to get to and from the main tourist attractions in Beijing. One essential item in our backpack was an independent travel guide book which contained Chinese characters for each tourist site. Our communication generally relied upon pointing to these Chinese characters soon after hopping into taxis. 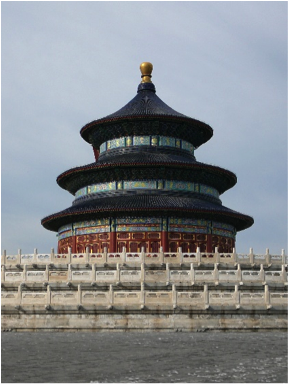 The admission fee for many tourist attractions in Beijing was based on height. Persons over 1.2 metres were charged the flat rate, and anyone under 1.2 metres in height was admitted free of charge, one of the advantages of travelling with young children. We visited the Temple of Heaven Park to marvel at the beautifully ornate Hall of Prayer for Good Harvests, and also enjoyed the atmosphere within the park itself. There were pockets of activities around the ancient cypress groves ranging from tai-chi, to games of kick shuttlecock, to a grooving grandmother with a flowing red scarf in her hand, energetically dancing to loud rock music. We strolled through the enormous Forbidden City attempting to imagine life during the 500 years of the Ming and Qing dynasties of emperors, when commoners were forbidden to enter. When we were swept away by a swelling crowd of tourists, we diverted from the main buildings to the less visited eastern part of the Forbidden City. 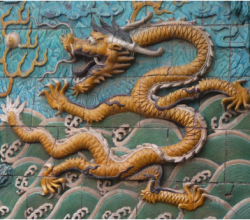 We admired the long, glazed Nine Dragon Screen and walked through several quiet courtyards and peaceful gardens before battling through the crowds once again. A large lake dominated in nearby Beihai Park, and with my children at the wheel, we slowly circumnavigated Beihai Lake in a rented battery operated boat. 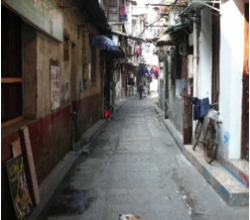 We explored the ancient alleyways (hutong), absorbing the sense of community as neighbours gathered for lively conversation and games of footpath chess and mah-jong. In the evening we headed for the theatre to watch the two thousand year old performing art of Chinese acrobatics, followed by death-defying, modern day motorcycle stunts, blending speed with precision inside a large steel ball. 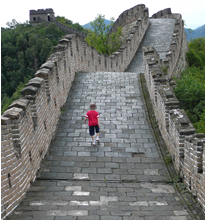 The Great Wall of China was definitely on our must-see list. 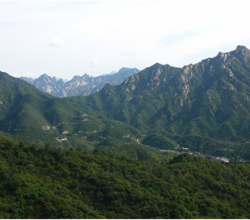 Locally, we hired a car with driver and drove to the Mutianyu section of The Great Wall, which lies 90 kilometres north-east of Beijing. An early morning start allowed some initial few moments of solitude on this impressive ancient structure set amongst beautiful rugged mountains. We walked for hours along stairs, bends and slopes from guard tower to guard tower. 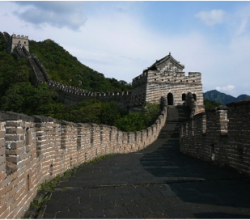 By midday, hundreds of travellers were also enjoying The Great Wall and the magnificent views. 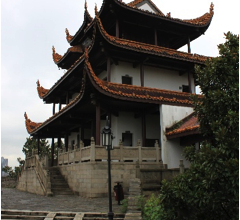 From Beijing, we flew to Hong Kong to spend a few days, then travelled back into mainland China by bus to Guangzhou, and continued by train to the Hunan province. The train comfortably sped from city to city through scenic rural China, past rice paddies and stunning limestone karst landscapes, at over 300 kilometres per hour. In the Hunan province, we were part of a team of travellers from around the world helping to care for abandoned, disabled children through the development organisation International China Concern (www.chinaconcern.org). It soon became very evident the positive difference that has been made to the lives of these children through this organisation. By the end of our time in China, we had all mastered chopsticks, enjoyed a wide range of delicious local cuisine, visited some of the main tourist sites, and tried out a few Mandarin words. My children eyed off the squat toilets suspiciously, spied skewered live scorpions at the street food market, diligently avoided the stray dogs, and soaked up the attention given to them by very friendly locals.